Polyglot is an addon for WPeMatico that lets you translate posts obtained from remote feeds before inserting them in your WordPress blog. It can work with any other extension and translate after processing the content. Lets you translate articles from one language to another. PolyGlot is an addon that lets you select the original language of articles in a WPeMatico campaign so you can translate them to one of the 107 supported languages. Alternative translator machine on translation failure. PolyGlot allows to enable alternative translation engines in each campaign, that will be used in case the main translation engine selected fail on it translation because the daily limit has been reached or returns empty content. With PolyGlot, you can use any of these 107 languages and translate into another: Afrikaans,Albanian, German, Amharic, Arab, Armenian, Azerbaijani, Bengali, Belarusian, Burmese, Bosnian, Bulgarian, Kannada, Catalan, Cebuano, Czech, Simplified Chinese, Traditional Chinese, Singhalese, Korean, Corsican, Croatian, Danish, Slovak, Slovenian, Spanish, Esperanto, Estonian, Euskera, Finnish, French, Western Frisian, Scottish Gaelic, Welsh, Galician, Georgian, Greek, Gujarati, Haitian, Hausa, Hawaiian, Hebrew, Hindi, Hmong, Hungarian, Igbo, Indonesian, English, Irish, Icelandic, Italian, Japanese, Javanese, Khmer, Kazakh, Kyrgyz, Kurdish, Laotian, Latin, Latvian, Lithuanian, Luxembourgish, Macedonian, Malayalam, Malay, Malagasy, Maltese, Maori, Maratí, Mongolian, Dutch, Nepali, Norwegian, Nyanja, Panyabí, Pastún, Persian, Polish, Portuguese, Romanian, Russian, Samoan, Serbian, Southern Sesotho, Shona, Sindhi, Somali, Swahili, Swedish, Sundanese, Tagalog, Thai, Tamil, Tayiko, Telugu, Turkish, Ukrainian, Urdu, Uzbek, Vietnamese, Xhosa, Yiddish, Yoruba, Zulu. Improved to use the most accurate translation engines. 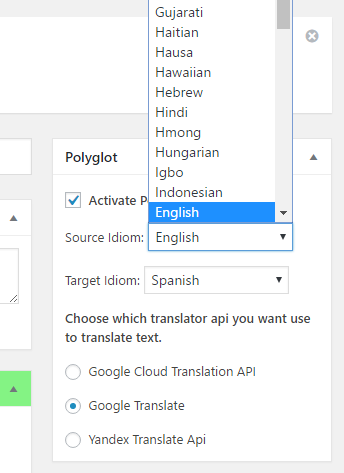 PolyGlot lets you use the most accurate translation engines and it was designed to allow you to easily add other translation engines, which will let us add different translators in upcoming updates. Free and paid available translation engines. Currently the plugin natively supports the Google Cloud Translation API, Custom Google Translate, Yandex Translate API and Deepl API. Works perfectly with other add-ons like Full Content, WPeMatico PRO, Facebook Fetcher, and more. PolyGlot has stable functioning with WPeMatico Free and WPeMatico Pro, plus all the other add-ons, like Full Content, Facebook Fetcher, and any other that interacts and modifies the content of the articles. PolyGlot waits for all the other add-ons to work with the articles obtained, and after the changes are ready, it translates them. Optimized to save on consultations with translation engines. Some translation engines work with paid quotas, charging per word or even per letter. PolyGlot optimizes the sending of words to the translation engines to save on unnecessary translations that increase costs, while also making the translation of articles as fast as possible. 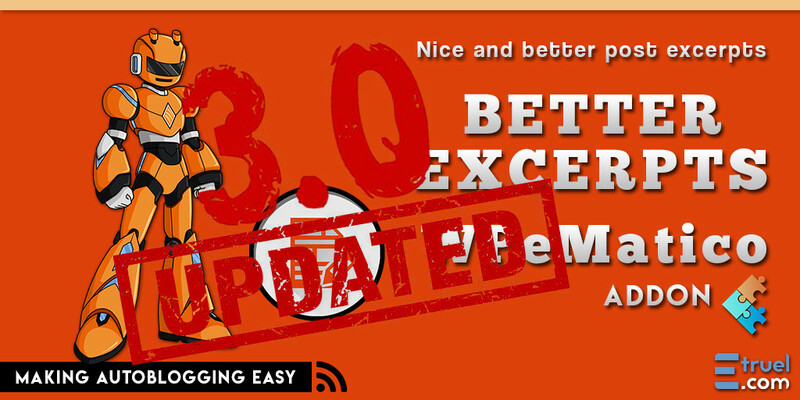 No word limits, translate articles of any length. The configuration of PolyGlot was designed to be easy for users. All you have to do is select the translation engine and add the API Keys if the engine requires them. Plus, we have prepared it to continue adding more translation engines. With PolyGlot configured, you can choose to activate it or not in each individual WPeMatico campaign, to translate the articles from that campaign, selecting the source language and the language it will be translated to, as well as the translation engine that you like best. 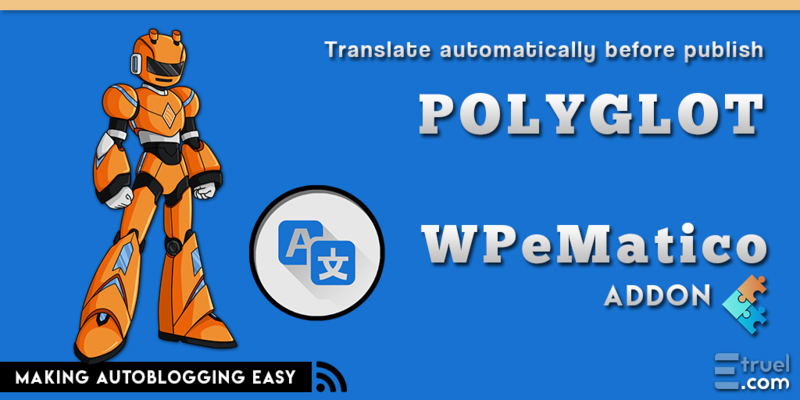 PolyGlot lets you translate any article obtained with WPeMatico!